i am sure that this has been answered 20 times, but i cannot find it; i am getting this VS 2k17 message when i start my new web project. Plz let me know how to fix. my temp fix is to go into IIS Express and do a manual start. thanks ahead for your answers. If not make sure you include enough info that anyone can use to be able to repro the issue. If it’s a general issue with IIS Express and not ServiceStack, submit it to StackOverflow instead. FYI; i have started a new project for this problem; i have done the 'dotnet-new mvc ProjectName'. I cleared the solution, built the solution, then ran the solution and still have the same problem. For my next run, i took out the https://localhost:5001 and this did not work. I have a shortcut for Vs2k17 and this prompts me for running Admin Mode (Y/N) i obviously click on Yes. I know 5000 is OK to use but for my 3rd run, i change it to 8888, sorry this did not work. I am at work right now but i will make sure the port assignment are available with the netstat -bano command. i will output this to a text file and make sure that my ports are not listed, also send this along to make sure this is documented ok with ServiceStack. At this moment, all i can say is that i checked and did not see 5000 or 8888 as a used port. note: one work around, if it helps is: i right clicked on the IIS Express in the lower right corner, there i click on the application with the port. This does bring up the application OK. This is why i do a Clear, Build and then refresh the browser. to summarize, i have started a new project that may have an issue with IIS Express but you have said its not a ServiceStack issue. I apologize if i was not very clear before and i mean no disrespect in going forward with my problem. yes, i am sure its just a my problem, hence my confusion and your thoughts on my PC issues. Thanks ahead for any thoughts / help. FYI I've just run into this issue, if you still run into this after changing the port, close the solution and delete the .vs/ folder than try re-opening and rerunning the project again. fyi, attached is a new project that i did this morning;, i did delete the .vs and have been doing cleans, then build solutions, then run. I also changed the port assignments. 5000 to 8888 and others. There is no project attached, please publish any test projects on GitHub and paste the link here. Here is the link: https://github.com/murphymj5209/ServiceStackORI. Saving and closing the solution, re-opening it and hit F5 to debug. 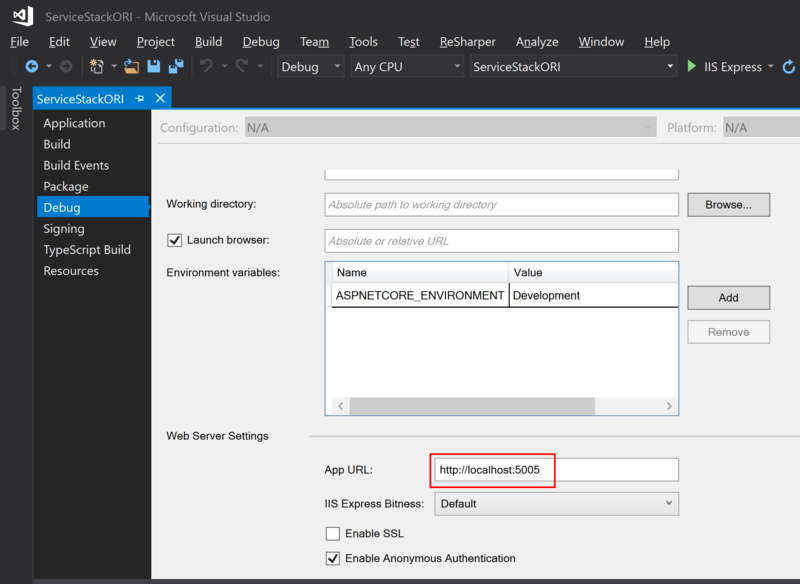 Note: VS.NET IIS Express does not support .NET Core's dual http/https binding so you must change the URL, Jet Brains Rider or VS Code runs the .NET Core executable directly and doesn't have this issue.